SellingRestaurants is honored to be given the opportunity to sell this classic neighborhood bar that's been operating for more than 30 years and is practically recession proof. 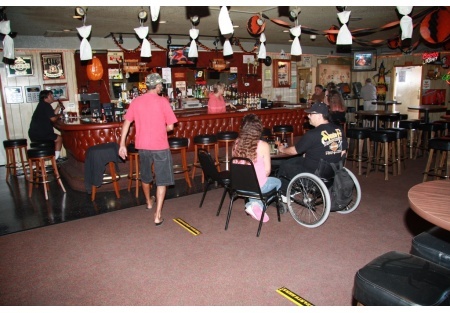 This is a typical bar where folks simply meet, hang-out, talk and have a few drinks. The business is stable; the bar is clean, neat and in good shape; the restrooms are clean, new and ADA compliant; there is plenty of parking; and the building looks to be in good shape with a BRAND NEW Air Conditioning system. The owner doesn't work the bar per se, although he does show-up between golf games to pay the bills and to catch-up with what's going on. Besides the great bar business there are multiple revenue streams with games and the ATM machine as well. The business has solid tax returns and history. We could get and SBA loan for the buyer with good credit, 20-30% down payment and bar experience. The adjusted net is outstanding at about $131,000 this year (2009) with revenues only down 4% over 2008. This bar was earning $165,000+ before the recession. Price is only 2.1 times THIS YEAR'S ANNUALIZED EARNINGS! STEAL IT, PLEASE! Now this rare bar could be yours, but don't hesitate because these places go fast because they're relatively easy to manage. Select one of the orange buttons below to get the name and address. This is a Paramount Restaurant Brokers, Inc. DBA SellingRestaurants.com listing.